In the company’s goal to promote sustainability and healthy city life, IKEA is releasing a bike, and it’s already won a major design award. IKEA has a knack for making very well-priced products seem aspirational. Take its 350-square-foot home setups. They’re filled with inexpensive kitchenware and assembly-required furniture and are likely a fraction of the size of our own homes, yet we walk through them and “ooh” and “aah” at the ingenuity, great design and clever use of space. The Swedish retail giant is taking that know-how outside the home and on a ride right through your community – literally. This October marks the release of its first bike, another well-priced, relatively ubiquitous offering that makes the consumer sit up and take notice. Created in partnership with Veryday design studio (the same people who designed many BabyBjrn products), the minimalist, multi-gender SLADDA bike aims at adding to IKEA’s commitment and reputation as a sustainable retailer. It will come in two sizes and is made with a rust- and oil-free belt drive that lasts for 15,000 km. It has automatic gears and an easy click-in system for accessories such as baskets and racks. There will also be an available trailer for hauling heavier loads. The international design community has already recognized the SLADDA. It recently won the Red Dot: Best of the Best award in the product design category. The SLADDA bike will be released October 2016 and will retail for $999 (the IKEA Family price, $599). 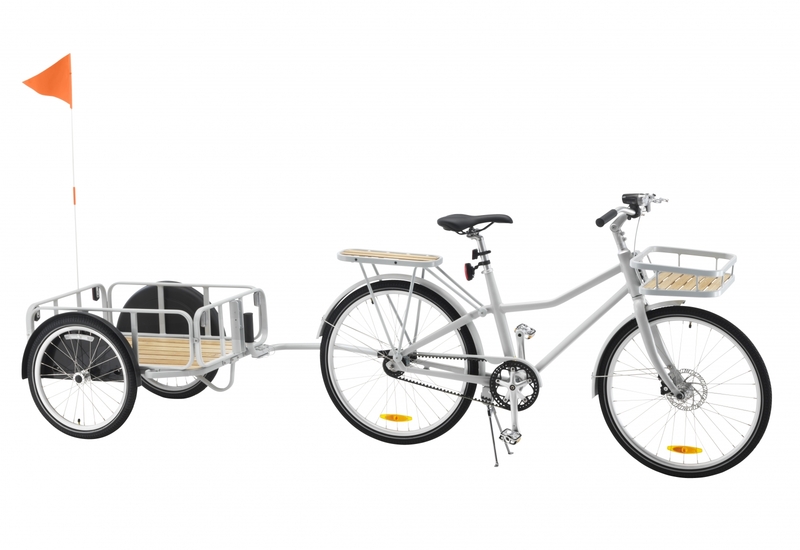 The bike trailer is an additional $329 ($259 IKEA Family price). The unisex SLADDA bike with the trailer.